Reliance Controls Corporation is located in Racine, WI and specializes in the manufacturing of a wide variety of electrical products. The primary product line consists of heavy duty time clocks and controls, generator accessories, transfer switches and transfer panels for portable generators and inverters. A manual transfer switch is used to connect a secondary power source, such as a portable generator or inverter, to circuits in a home or building that are wired into the electrical system. The transfer switch isolates the generator power from the utility power making it safe to use the generator as a backup source to run critical circuits in the event the main power fails, and eliminate the possibility of “back feeding” the utility line. The Pro/Tran® models can accommodate up to 10 circuits and generators with a 50A 125/250V outlet (around 12,5000 watts), and the Panel/Link® models are rated up to 200 amps and can act as service or feed-through disconnects, stand-alone main panels, or sub panels and can accommodate up to a 31kw generator. More specialized transfer equipment is also available for traffic signals, telecommunications sites, and other light commercial applications. Many accessories used with generators are available, such as heavy duty outdoor generator power cords, outdoor remote power inlet boxes, and NEMA and non-NEMA plugs and connectors. The Home Protector® (THP) line of products includes various home monitoring systems, alerts and alarms, geared towards providing alerts during power loss, heat loss, and upon detection of unwanted water. Reliance Controls Corporation began as "Reliance Automatic Lighting Company" in 1909 with the invention of the heavy-duty commercial time switch. 1909 The first “RELIANCE” time switch was an eight-day, spring-wound clock-operated switch that would automatically control lighting for apartment houses, store windows and electric signs on a daily schedule. The growing electrical industry found more and more applications for Reliance time switches and the company expanded rapidly. 1923 In 1923 Reliance introduced the “ACE” self-winding time switch. This remarkable design incorporated an electric motor that would actually wind the clock spring automatically. This was the first Reliance time switch that did not have to be wound on a weekly basis. 1930 In the 1930's, Reliance pioneered the synchronous motor-driven time switch trend with the heavy-duty "BADGER" series. 1969 In 1969 Reliance introduced the compact and rugged Series 500 time switches. 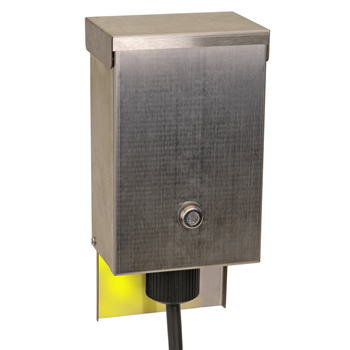 The Series 500 has been used on billboards, water heaters, lighting and any place electrical power needs to be controlled on a daily schedule. Today the Series 500 is the quality standard for the industry. 1983 In 1983, Reliance introduced the first manual transfer switches engineered specifically for use with portable generators of up to 5000W. ...and generator-ready load centers for use with standby generating systems to 31.5kW (pictured on the left). 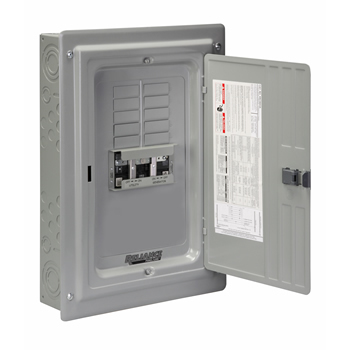 Today the Panel/Link Series encompasses over 300 models including 3-phase and prewired panels. 1999 In 1999, Reliance Controls Corporation introduced the Easy/Tran® for use with traffic signals, cell towers, irrigation systems, community well pumps and more. The Easy/Tran is the original “point-of-use” transfer switch. 2003 In 2003, the original Reliance Gen/Tran(TM) line of manual transfer switches was replaced with the vastly improved Pro/Tran® Series which accommodates portable generators of up to 12,500W. 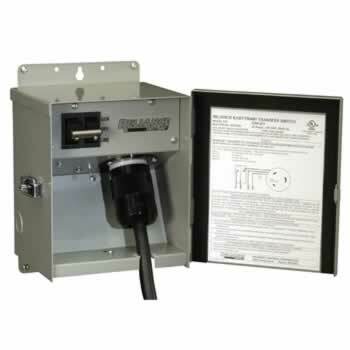 The Pro/Tran® is also the first loadside transfer switch to be listed to the new, and more stringent, UL1008 standard. 2005 In 2005, Reliance Controls Corporation added the Pro/Tran® Q Series. 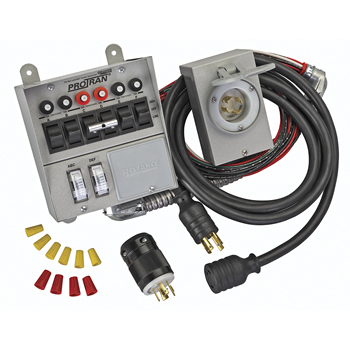 The Q is a totally unique loadside transfer switch featuring conventional 1-inch interchangeable circuit breakers for easy upgrading and adjusting of branch circuit protection on the generator side of the transfer switch. It is ideal for heavier residential loads such as water heaters, deep well pumps, septic lift stations and central air conditioners. The Q Series is available with the exclusive Reliance electronic bar graph meter which monitors voltage and wattage on each generator leg. 2007 In 2007, Reliance Controls introduced the SelecTran(TM) Series. The first expansion panelboard engineered for use with a new or existing residential automatic standby system. SelecTran is designed to overcome the major limitation of automatic systems, which is that they can power only a limited number of circuits in accordance with the National Electrical Code. Even when the homeowner is present, non-emergency circuits in the main panel, such as the garage door opener or dishwasher, are unavailable. SelecTran makes any circuit in the load center available to be manually switched to the standby generator while maintaining full code compliance. The SelecTran allows a smaller, less expensive, automatic standby system to provide temporary power to even more circuits than a much larger and more expensive standby generator. 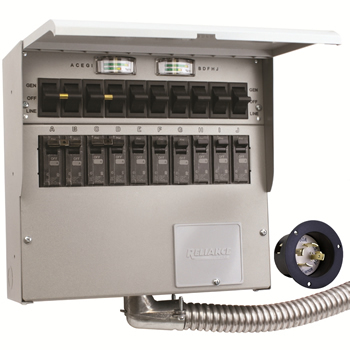 Also in 2007, Reliance Controls Corporation introduced the Panel/Link® X Series of manual transfer panels. The X Series was the first manual transfer panel engineered specifically for use with portable generators equipped with ground fault protection outlets. The X Series features a patented sequential neutral-switching mechanism that will open the two hot legs before opening the neutral leg. It will then close the neutral leg before it closes the two hot legs. This ensures that sensitive 120V electronics and inductive AC motors are not subjected to damaging 240V current resulting from a possible momentary loss of the neutral during switching. 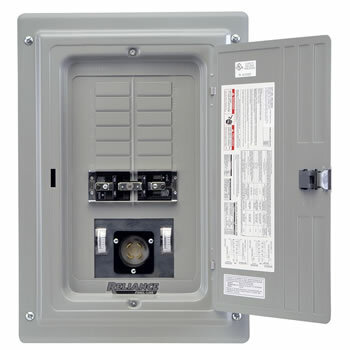 2010 In 2010, Reliance Controls introduced the PBN Series, the first non-metallic power inlet box to be listed to the new UL1008 standard by Underwriters Laboratories Inc. Constructed of .150” UV stabilized ABS, the PBN is designed for heavy-duty outdoor residential and commercial installations. The exclusive Pop-Fast(TM) ½” knockout design makes for exceptionally fast installation and the interior provides over 100 cubic inches of wiring space. The patented slide-out base permits easy 360o access to the terminals of the flanged inlet for fast wiring. 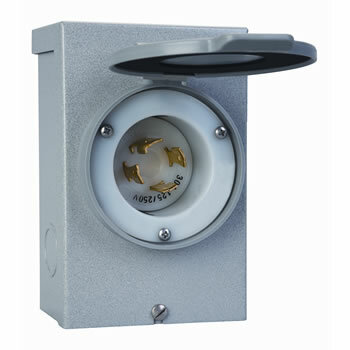 The bottom-mounted, water-resistant and bug-proof flanged inlet cover is standard. Also in 2010 Reliance Controls introduced the SoniCord(TM), a unique 17-inch cord with a built-in power failure alarm. Designed to monitor essential 120V cord-connected appliances for accidental cord disconnect, power outage or circuit breaker tripping. 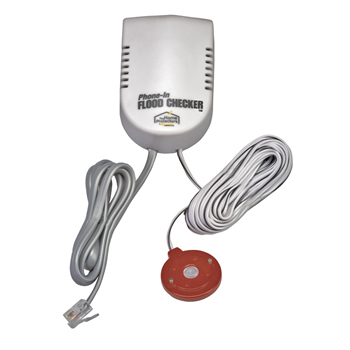 The SoniCord is perfect for use with refrigerators, freezers, sump pumps, aquariums, wine cellars and much more. It is designed to address the nuisance tripping issues associated with GFCI and AFCI circuit breakers. 2011 In 2011, Reliance Controls introduced the EcoTran(TM) , the first uninterruptible automatic transfer switch designed to provide a safe and simple method of powering designated branch circuits from renewable AC power sources such as battery powered inverters driven by wind turbines and solar arrays. The EcoTran is unique because it recognizes the renewable power source as the primary power source and the utility power as the secondary. This approach maximizes the uptime on the renewable source while facilitating seamless transition, in less than 20 milliseconds, to utility-supplied power when renewable power is not sufficient to operate the connected loads. The EcoTran will automatically switch back to the renewable source, also in less than 20 milliseconds, when sufficient power is available. The switching speed of the EcoTran is so fast as to be unrecognizable to even the most sensitive electronic equipment. The electrical-over-mechanical transfer switching and interlocking system prevents accidental back feed of the renewable power source onto utility lines. As the leader in portable standby power integration, Reliance Controls Corporation has contributed more innovations than any other single manufacturer and has been awarded over 85 patents on manual transfer switches, time switches and accessories. And after over a century of innovation, Reliance Controls Corporation has built an enviable reputation for high quality, superior engineering and exceptional customer service.